The first approach to this project was a clearly emotional one, at least on my part. It was my love for the island, my love for the art of ceramics and my respect for the ceramics tradition that exists in Sifnos. The first meetings of the artists started a series of discussions with the exchange of their different opinions. There were disagreements of course, which in the end had a constructive function and I believe that the most positive thing is that we all together formed the concept of the exhibition and the directions this project should take. Contacts with the ceramic workshops of the island followed. They did not take part in planning the concept of the exhibition but I hope this will happen next year. Though everything was an experiment this first time, the outcome was much more successful than we had hoped. For they trusted us, they wanted to try with us and for this we would really like to thank them. Very important was the role of the location the exhibition would take place, The Monastery of Fyrogia. Sublime but welcoming at the same time. I think from the very beginning it became connected with our ideas and our choices. - The priests who gave us the use of the Monastery of Fyrogia for the exhibition. - The Municipality of Sifnos for its support and collaboration. - The National Bank of Greece who trusted us and sponsored the project. in collaboration with the workshop of Antonis Atsonios. 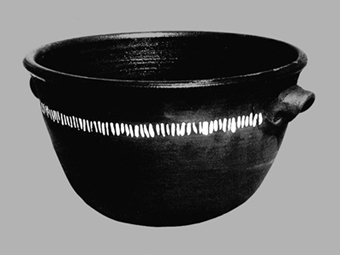 ΚΑΖΑΝΙ: Traditional Sifniot vessel in which the milk was stirred to make cheese. Otherwise an exquisite form. I imagined it in black. Inside, I put the sea; full of emotions. 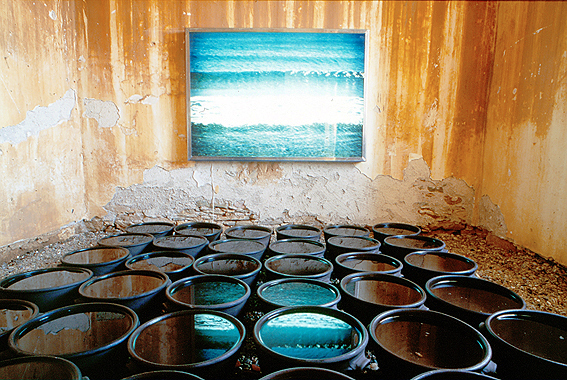 Installation in a cell of the Monastery. The floor is strewn with pebbles from the beach next to Atsonios’s workshop. With the smell of the sea. 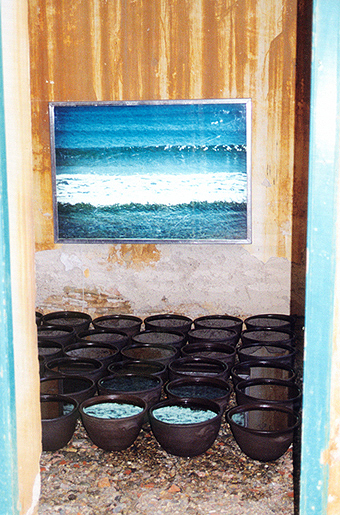 A lightbox with an image of the sea. 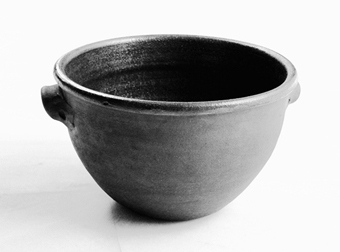 Twenty-four ceramic vessels (Kazania) full of water (sea). The speakers play the sound of the sea on the beach.